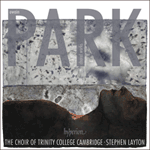 As with Justorum animae, which similarly sets a text with a theme of departed ones at rest, this richly textured eight-voiced setting of Binyon’s renowned poem is filled with the interplay of voices. It begins with sopranos and altos radiating almost tentatively upwards and downwards in mirror image from a single note, singing a motif spanning just a major third (‘They shall grow not old’), answered by tenors and basses with their own motif (‘as we that are left grow old’), likewise contained within a narrow pitch range. The music gradually expands to fill a wide compass from high soprano to low bass, but then it progressively becomes simpler, with all voices persistently recalling the music of the opening with its single note and its ‘They shall grow not old’ motif to underline the idea of a memory that can never fade. The scheme of this deeply felt piece could possibly be modelled on Purcell’s Hear my prayer, O Lord, likewise an eight-voiced a cappella anthem which expands from a single voice to a quite passionate climax, subsiding to a tranquil final open-fifth chord (neither major nor minor). For the fallen was written in 2016, inscribed ‘for Joseph Wicks and the Beaufort Singers’.